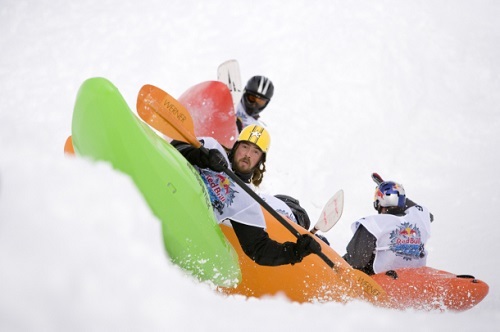 Snowkayaking – A New Extreme Sport? So first of all let’s go on record as saying that this cannot be regarded as an entirely new extreme sport – the simple fact that people have partaken in the event tells us otherwise, but for the most part, this is an uncovered, and largely uncompetitive sport that is growing in popularity all the time in the places where it is possible! 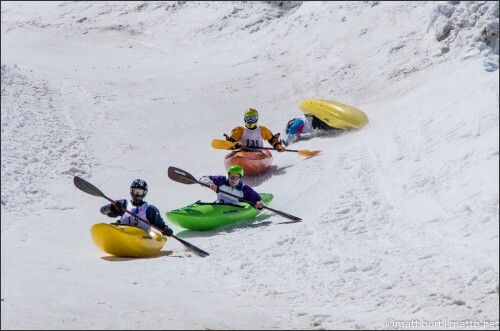 Snowkayaking is a combination of skiing or snowboarding – in a kayak! Quite simply, all you have to do is find some snow, and strap the kayak to the roof of the car! Head for the nearest big hill, and point it downwards! As with all extreme sports, it’s as much about style as it is about victory, and given that there are so few organised events, it’s often just about the thrill. This is not an entirely uncovered sport. There have even been world championships held, and Red Bull have sponsored some big events in the past. Head to YouTube and you can find a raft of videos of people hurtling down the mountainside aided by nothing more than a paddle and a decent spraydeck! But at the moment the following, along with the number of recognised competitors is small. The question is, will it grow to become a popular sport? The easy answer is no. It’s not as easy to carry a kayak as it is to carry a snowboard, so first of all the logistics of the sport are a problem. You then have the fact that you are frankly going to be regarded as a danger to most other snow users – can you imagine what you would do if you found a snow kayak hurtling towards you if you had come off your snowboard? Add to that the obvious problems with trying to take a kayak on a ski lift, and you understand why the sport might struggle to grow! How Can the Sport Grow? Simply by finding stars. The moment someone comes along and starts producing tricks on a kayak on the snow, people will be interested. Like any sport, it takes some stars to get the imagination of the public going. Quite simply, find a hill with enough snow on it, and somehow find a way to the top! Obviously safety precautions need to be taken, as much for other people on the snow as much as for yourself. It’s best to start off somewhere where you won’t encounter other people on the snow, to make sure you can actually control the thing! We love our extreme sports, and the more zany the better! It’s a big hope that this sport can take off, at least to a degree. We feel that it’s never going to attract a significant amount of performers, but if enough talented people get involved in the sport itself, it could at least become a very popular spectator sport in the world of extreme sports. This entry was posted in Bizarre, Featured, Winter Sports and tagged Extreme Sports, Snowkayaking. Bookmark the permalink.